Cashew Sour Cream- Subscribe to The Carrot Crew for this delicious dairy free recipe! Wash & dry spaghetti squash, then using a sharp knife carefully cut off it’s head. It’s cool, the squash knew it was coming. Slice squash in half lengthwise, being very careful and making sure to work your knife AWAY from your body. Using an ice cream scoop, remove all the seeds and guts. Kids love to help with this! Brush or spray just a little oil of choice, and sprinkle all 4 halves with salt. Place face down on a baking sheet, and set aside. Wash and dice the rest of your veggies- these will go in the oven with the spaghetti squash so everyone can get nice and roasty together. Toss ALL veg- bell pepper slices, corn kernels, onion slices & zucchini onto your baking sheet and drizzle with oil. Sprinkle on spices, then use your CLEAN hands to incorporate. Roast for ~40 minutes, until squash skin is fork tender. In a large mixing bowl, add chorizo if using, or drained and rinsed beans. Dump in 16 oz jar of salsa, and mix to combine. Once veggies are done, add all the diced veg right into your bowl. Allow squash to cool for at least 10 minutes before handling. Once squash is cool, carefully scrape out flesh (see why it’s called Spaghetti Squash? Get it?!) using a fork. Be careful to not poke any more holes in your skin, since this will become your bowl. Add ALL spaghetti squash flesh to your bowl and mix everything well. Taste and add salt if desired. I didn’t add any more salt with the chorizo which is already quite salty. You’ll probably want a touch more if using beans. Feel free to add a bit of hot sauce as well to boost flavor if using beans. 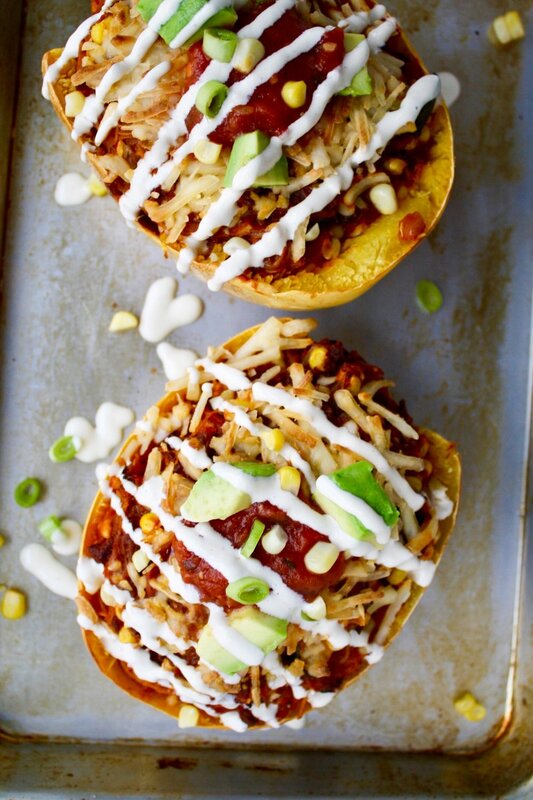 Scoop this DELISH filling into your empty Spaghetti Squash bowls. Top with some shredded non dairy cheese, if desired. Pop back into the oven and bake for 10 minutes, then broil for 5 minutes to melt the cheese. Depending on the brand you’re using, it might not melt but the flavor and mouthfeel will still be wonderful! Remove from oven, and let cook for 5-10 minutes before garnishing with Cashew Sour Cream, more salsa & green onions. Enjoy! Leftovers keep well in the refrigerator for 3-4 days. Microwave for ~1 minute or in the oven at 400° for ~10 minutes.